Last year Pinkerton and Winnacunnet showed that it's not necessarily the team with the most individual talent or the team that looks the best on paper that wins it all. Instead, whether you have a group that plays as a TEAM unbelievably well (Winnacunnet) or you have the most dominant player in the state (Pinkerton) it can end up playing a much larger role. Then there's also other factors, like having one of your star players injured right before the playoffs which can affect the way things turn out you (Trinity and Merrimack). In the end though, there really are so many factors that can affect which team ends up cutting down the nets in March. That's what makes it so much fun to watch unfold. This year you have 3, maybe 4 teams at the top who do appear to be a notch above the rest. But even still, there is no clear cut favorite, no team that is heads and shoulders above everyone else (like Milford in D-II). So let the season begin - and the debate over these rankings! Here is a ranking of how the division's top teams are looking heading into the season. It is NOT a predicted order of finish - I don't take strength of schedule into account. I rank how good the teams are and that's it. Last year BG had the most talent in the division, and they also had the division's deepest team. Neither of those have changed this season. Head coach Jim Migneault likes to play 11-13 player rotations, and he definitely has the kind of team to be able to do that once again. BG has a lot of talented players, pretty much all of them have varsity experience, and they're all juniors and seniors. Leading the way are 6'4" seniors Connor Green and Sean McClung, who are both capable of putting up 20+ points on any given night. Then you also have 2 incoming transfers who will provide even more scoring punch. Junior guards Brad Holler and Logan Kesty come from Exeter and Trinity, respectively are both are talented players who look to make an immediate impact on their new team. 6'0" senior guard Nick Pyzocha is a hard nosed, scrappy guard who defends well and drives it hard to the rim. He compliments the 4 main scorers nicely, as he's more of a pass-first, shoot-second kind of guy who does the dirty work on defense and doesn't mind if the other guys score more points. 6'4" junior wing Joe McCarthy, 5'11" senior guard Kyle Remillard and 5'9" senior guard Mike Kelly are all good players who will provide depth for this team but they're all coming back from injuries. These guys might not be in the lineup when Guertin takes on #2 ranked Central on opening night, but they should all be there by the New Year and when the games matter most in March. McCarthy was one of the top JV players in the state and is an athletic 6'4" kid who is quick and can also shoot it. Remillard and Kelly are both excellent defenders, and along with Pyzocha they give the Cardinals 3 of the top defensive guards in New Hampshire. McCarthy gives them another guy who can score the basketball and get up and down the floor quicker than most kids his size. Providing even more depth is 6'1" senior wing Steve Cuipa (led the football team to D-II state title), 5'9" junior guard Nate Chartrand (also recovering from a football injury), 6'0" junior wing Cooper Paul and 6'1" junior forward Jordan Corbin. Like always look for BG to run a full court press all game on defense along with a motion offense. They have a ton of depth and talent, if they can get healthy, stay healthy and have everyone play as a team they will be VERY tough to beat. Central returns literally everybody from last year. They took their lumps at times with a group of sophomores and juniors (and 1 freshman), but now those guys are all juniors and seniors (and 1 sophomore). The Little Green have a super star (John Wickey), a star in the making (Gabe LaCount) and a group of hard working, skilled role players who all get after it on both ends of the floor. Wickey is a definite Player of the Year candidate. He just continues to get better and he has a very impressive skill set for 6'7" kid. Wickey can knock down the three with regularity, can face-up from the 3 point line and go by people off the dribble, has a nice spin move that he likes to use in the lane, he competes hard on defense and he's unselfish enough to pass out of the double team to the open man. LaCount is another player who just keeps getting better. He's 6'0", but judging by his genes and the size of his feet he could end up being 6'5" which gives him a lot of upside. LaCount has a scorer's mentality, he's an excellent slasher with an improving jumper. He can handle the basketball, always pushes it hard on the break and plays hard on both ends of the floor. Returning to the lineup for Central from knee surgery is point guard Joe Stisser. When healthy this kid is really an impact player. He returned from a knee injury last season and just when he was really starting to play well he hurt it once again. If he can stay healthy and play well though it just adds another dimension to this team. Another guy who can play the point for this team is 5'7" junior Dyland Lafond, a transfer from Trinity. Lafond is a good player who plays hard and has a very good handle. He wasn't getting the playing time at Trinity, but he'll definitely be a contributor at Central. 6'2" junior forward Junior Brown is a very athletic player who can really defend the basketball. He's only been playing basketball for a couple years, but is getting better by the day. Also look for 6'3" sophomore forward Christian Ortega and 5'8" senior guard Audie Melendez to provide dpeth and quickness to a talented Little Green rotation. Look for this team to get out and run offensively and pressure and trap the basketball defensively. Like BG, they'll force a lot of turnovers and get a lot of easy baskets on the other end. Head coach Doc Wheeler will get the most out of this team, and I expect them to make a run at it in March. Unfortunately though they lost Wol Majong to Trinity and sharpshooting guard Stephen Ferge won't be playing for Central this year either. I had them ranked #9 in the division. Then at the end of the summer, right before everyone went back to school word got out that the best player in the state was transferring to their school from Trinity. Now the Crusaders have two top 10 players in David Madol and Shomari Morgan, plus Mike Fitzpatrick who is arguably the best coach in the state. And just like that you have a top 3 team. Once again Memorial will have some strong senior leadership. They could go with an all senior starting lineup of the 6'5" Madol, 6'1" wing in Morgan, 5'8" point guard Rodney Martinez, 6'1" wing Heavens Desire and 6'1" sharpshooter Nick Wheaton. The Crusaders have also added 6'1" senior wing Timi Laniyan (transfer from Trinity) to their roster. Other players to watch out for are sophomores Joel Mayola and Tong Akot. Both players bring athleticism and quickness to the table. Only at Trinity can you graduate 2 starters (Phil Hayden and Gordon Duffley) and have 4 players transfer out of the program, with 1 of those 4 players being the division's reigning Player of the Year (Madol) and STILL be a top 4 preseason team. Well that's exactly what Trinity is. This is still a VERY deep and talented basketball team. 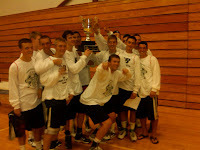 The Pioneers actually beat Milford over the summer in the BST Summer League playoffs. And yes, Jamie Holder didn't play in that game for Milford, but neither did Trinity's best player Zach Stevens. Stevens returns to action after tearing his ACL in the last game of the regular season last year vs. Pinkerton. He is definitely back to his old self though, as Stevens poured in a game-high 21 points at the Eastern Basketball Preseason Showcase event a couple weeks ago. He now has a very good all-around game, and is much more than just a shooter. Trinity will be a very difficult team to score points on. You have 6'0" junior guard Hunter Viscarello (one of the state's best perimeter defenders), along with 3 players who are 6'7" or taller who can all block, deflect or alter shots in the paint. I call them the "Trinity Tri-Towers." With Viscarello defending the opponent's best guard and 6'9" Silvere Aluko, 6'7" Mabor Gabriel and 6'7" Andrew Lauderdale blocking shots in the paint this will be a very tough team to score points on. 5'9" junior guard Jake Hamel is also a scrappy player who takes charges on defense and is one of the better spot-up shooters in NH. Also providing scoring punch are 5'11" sophomore guard Travis Descoteaux and 6'0" junior guard Wol Majong (transfer from Central). Yes, this team is even deeper than that. You also have 3 of the best freshmen in the state in guards 5'10" Patrick Keefe (head coach Dave Keefe's son), 6'1" Carmen Giampetruzzi (sweet shooting stroke) and 5'6" Dawson Dickson. These guys will all compete for minutes off the bench. They're all very talented players though who do have the ability to play varsity basketball. The top 4 teams appear to be a notch above the rest. But Merrimack is the best of the rest. Dimitri Floras had a HUGE breakout season last year as a freshman, and this year he will try to top that season. And although Floras is the Tomahawk's only returning starter, they have plenty of talented players in addition to him. Floras is a gifted player who can score the basketball in a variety of ways and also knows how to win. He had 20+ points against Dover and BG last year, and also poured in 25 in the playoffs vs. Londonderry. Also look for 6'4" junior wing Tyler Gendron to have a breakout year. He's a very tough match-up, a versatile player and had some big games during fall league action. He's a potential all-state player who can attack the rim and also knock down the 3. Other players to watch out for on this team are 6'3" sophomore guard Brandon Malloch, 6'1" senior Tyler Amigo, 5'10" junior guard Bryan Courtemanche, 6'2" freshman guard Eric Gendron and 6'4" junior big man Jeff Giannelli. All of these guys can really get up and down the floor and make plays and all have a toughness to them. Others who will fight for playing time are 6'4" junior forward Jared Peabody and 5'9" senior guard Ryan Brownell. This is a team with plenty of talent, but definitely lacks experience. They have just 2 seniors, their best player is only a sophomore, they have just 1 returning starter and just 3 guys back who were varsity regulars last year. They have more size than they did last year though and more offensive firepower. If they can play consistently on the defensive end they could definitely be a scary squad to face. The Green Wave graduated a very good senior class, led by 1st team all-state player Alex Burt. But this will once again be a tough, hard nosed team that will get after it on defense, be disciplined offensively and have a couple of big time scorers (who are both seniors) to lead the way. Dover has a pair of seniors who have been starting since they were sophomores in 6'3" forward Morgan Faustino and 6'0" point guard Kenaan Al-Darraji. Faustino is a strong inside scorer and rebounder who also defends well and can face-up from the perimeter and drive by slower bigs. Al-Darraji is a knock down shooter with a killer-pull-up jumper who also plays tough defense and knows how to run an offense. Both guys are potential all-state players. 6'1" junior Jarell Mejia and 5'11" senior Bubba Mahan are both tough, scrappy wing players. Mejia is very athletic, explosive off the dribble and can also shoot it. Mahan is one of the best defenders in the state who can also score if you worry too much about the other guys. Senior forward Kyle Wilson (star football player) rounds out Coach Romps' starting unit. Wilson will be looked to for rebounding, defense and toughness underneath the basket. Look for 6'4" sophomore wing Mike LeBlanc and 5'10" sophomore guard Colin Shaughnessy to provide depth off the bench for the Green Wave. Star guard Richard Valentin and forward Greg Asselin were both listed as seniors on the team's roster last season. But they were both underclassmen academically. Their plan was to petition the NHIAA for an extra year of eligibility to play basketball. It didn't work. If both players were granted the extra year then West would easily be a top 3 or 4 team in Division I, as they would have their top 6 players all back from a team that at one point was a top 3-4 team in D-I LAST YEAR. Instead, having seniors Samy Abdalla, Quintin Hunter, Jose Gonzalez and junior Aaron Martin all back playing together is not a bad consolation. These guys are all athletic players who can play the game at a fast pace. Abdalla does a nice job of defending and pushing the ball on the break. Hunter is an explosive athlete who can slash to the basket at will and is like a human pogo stick. Gonzalez is a 6'3" forward who has solid post moves, defends well in the paint and has a good toughness to him. And Martin is a solid all-around wing player at 6'4" who can score the basketball inside or out. The Blue Knights have a number of other fast, athletic guys who ca get up and down the floor on offense and pressure the basketball on defense. Look for 5''10" sophomore guard Carl Jacques to make an impact on this team and fit right in with their up and down style of play. North is a year away from being a preseason top 3 team in the state (they WILL be next year), but for now a top 8 finish would be nothing to sneeze at. Especially when you consider that North returns just 2 starters and only 1 of their top 7 guys is a senior. Their 3 best players, 4 of their 5 starters and 6 of their top 7 players are ALL juniors. That's why I said they'll be good now but a year from now they'll be REALLY good. The junior class includes 5'10" guard Javon Williams, 5'11" guard Ryan Gauthier (both are top 5 players in the Class of 2012), big men Mike O'Connor and Jake Mellin, wing Anthony Farmer and guard Liam Burke. Williams and Gauthier form one of the state's best back courts. They can both get up and down the floor in a hurry, handle the ball, shoot it and drive. O'Connor is one of the more underrated players in the division and I expect him to make a name for himself this season as a versatile big man who will be able to take some pressure of the Titan's star guards. They're the defending division champs, but this will be a MUCH different basketball team than the one that hoisted up the trophy in March. The Astros really relied heavily on 6'7" center Zach Mathieu and 6'5" forward Ben Proulx, especially Mathieu who was the most dominant player in NH. That was their identity last year - getting the ball inside to Mathieu, Proulx and Alex Patrikis. They were a half court team, they slowed the game down, controlled the ball with point guard Chad Park and pounded it inside to a player nobody could stop. Park and Patrikis are back and will try to lead this team to a top 8 seed. Park is a good little point guard who is tough as nails and makes big plays. the 6'4" Patrikis really benefited a lot from playing alongside Mathieu and Proulx. It will be interesting to see how he does this year now that all of the attention by opposing interior defenses will be on him. The guy I look for the break out from this team (and I'm VERY surprised no other media outlets seem to be mentioning him) is 6'3 wing player Chris Light. Last year he saw some pretty good minutes off the bench here and there. But this season I expect him to really be a factor for this team and assert himself on the offensive end of the floor. Pinkerton also brings back guards Ryan Williams (defensive stopper) and Kevin Colbert who were both key players on last year's title team. Star guard Alex LaRosa and outstanding coach EJ Perry will be VERY tough losses and they're the reasons why I can't rank Salem higher than this (along with the lack of a true point guard). Still, this is a talented team with a dominant inside player and one of the best shooters in the state and they could definitely make some noise. 6'4" senior forward Joe Gallant somehow seems to fly under the radar by some when discussions come up for the top players in the division (him and Shomari Morgan from Memorial are both in for BIG years). Gallant is a big, strong, powerful player who is physical and fundamentally sound in the post. He rebounds well on both the offensive and defensive glass and also runs the floor well for a big man. Look for him to be the team's go to guy and a possible 1st team all-state player. Here's another name to add to the list of potential break out players - Jeff Meisser. A pretty good crowd gathered at Memorial High School earlier this fall to see Salem play Trinity in fall league action. Meisser had not 1 but 13 three pointers in that game. That's 42 points in one game just on threes. Now I know it's just fall league, but the bottom line is the kid is a definite breakout candidate. Other key players returning from last year's team include senior forward Mike Lorenz, senior wing Matt Cannone and junior guard Jonny Klecan. So while the Blue Devils will miss having LaRosa in the lineup they do return 4 starters and 5 of their top 6 players off last year's team. The departure of coach EJ Perry (now coaching football at Andover High in Mass) will also hurt. Perry was widely regarded as one of, if not the best basketball coach in the state. Rob McLaughlin, who was the JV coach for the last several years takes over the position. This will be young team, and they also may start off a little slow as key players like Steve Cronan, Sean Dolan and Spencer Cutting shake off the football rust. One guy who's not rusty though is senior guard Shaun Munson, who is primed for a big season. Munson was the 6th man on last year's Winnacunnet team that made it to the title game. He has looked impressive in fall league action as well. Youngsters to watch out for include sophomore Matt Guerin and freshmen Chris Doyle and Rich Ruffin (Tiffany's little brother). You also have 6'6" junior forward Christian Oweifie who is an athletic big man who can jump threw the roof but still has a pretty raw skill set. Scrappy team that had a big win in last year's prelims over Merrimack. Quite a few guys are back from that team, including potential all-state player Mike Colby, Ian McMullen, Jared Schwalbe, Nick Martinez and Troy Mansfield. Colby is a knock down shooter, Mansfield brings size and rebounding. Martinez and McMullen are tough athletes who can drive to the rim and Schwalbe is a solid floor general. Also expected to contribute is Tyler Ball. The popular sleeper pick this year, Spaulding impressed a lot of people at a summer tournament held at Exeter High where they beat some pretty good teams. The Red Raiders will be led by sharpshooting senior Brian Cronin (son of head coach Tim Cronin). Brian is very good leader. Also look for solid years out of 6'4" sophomore forward Dominic Paradis, 5'9" senior point guard Justin Slattery and 5'8" guard Taylor Guilian. Slattery had not 1 but 9 steals in one game this preseason that I saw when Spaulding played Somersworth. Definitely a team that could make some noise with talented players like 6'1" senior guard Caleb Donnelly, 5'11" junior guard Tony Beaulieu and 6'5" junior forward Jim Tomaswick. From what I've see of them they are probably a notch below some of the top teams in the division but they'll definitely be a competitive squad. Depth could be an issue, but with a strong starting 5 of 5'8" junior point guard Andrew Breen, 5'8" senior guard Bryan Cassidy (most underrated shooter in the state), 6'0" wing Colin Sloane, 6'4" senior forward Kevin Perry and 6'5" senior forward Jake Siemering these guys will be competitive against most teams. Breen is a tough kid who plays with a lot of heart and just flat out makes plays. He's one of the most improved players in H over the past year. Cassidy can shoot it from anywhere, Sloane is a crafty slasher and Siemering is a versatile big who can score inside or out. Tough off-season for the Blue Hawks. They graduated all 5 of their starters. Then 2 guys who they expected to have big junior years for them (Brad Holler and Tim LaRoche) are both gone. Holler transferred to BG and LaRoche tore his ACL. Then Quentin Bullen (played JV last year but likely would have been a rotation player on varsity this year) transferred to St. John's Prep in Mass. Look for sophomore guard Matt Barr to have a big year for an inexperienced Exeter team. This is a South team tha really struggled last year, and didn't even make the playoffs. Then they graduate star guard Jake Nelson and sophomore phenom Kaleb Joseph (as first reported on this site) transfers to Cushing Academy, a prep school in Massachusetts. Look for Anthony Muccioli, Nilsson Basora and Chris Thistle to step up in their places. The Blackbirds had their best player (Theo Speas) move to Florida and they also decided to not renew the contract of their coach (Joe Giovannangeli). Taking over as coach is Bill Johnston, a former Keene High and Keene State College player. And taking over as the team's best player is 6'4" senior forward Taylor Russell. Concord has gone win-less in the division each of the past 2 years. The 2 guys who impressed me most during summer/fall leagues were Jourdain Bell and Steve Desmairas. Well, it turns out Bell is only an 8th grader and Desmairas has since transferred to Bishop Brady.